Whether you’re starting a brand new side hustle or working on your business full-time, it can be tough to know where to invest. When you have multiple priorities but a small budget, spending money on anything can feel scary, especially if you don’t know what will pay off. What will give you the greatest return on your investment? And where should you spend your precious dollars? I’ve been reflecting on this quite a bit myself, and in today’s post I wanted to share the best investments I’ve made in my business. 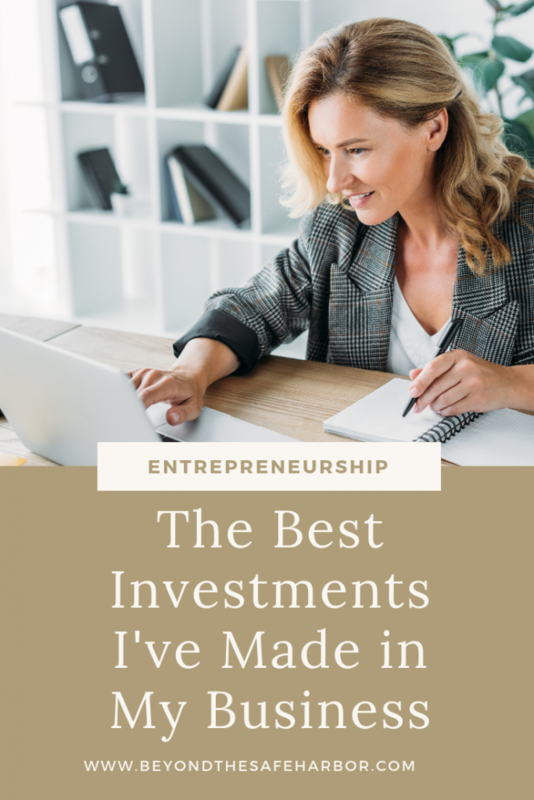 This post will focus on this blog, though check out this post if you’re interested in the best investments I’ve made in my Etsy business. Without further ado, here are the best purchases I’ve made. The largest financial investment I’ve made in my business has been Elite Blog Academy (EBA), a thorough and intensive blogging course. Created by Living Well Spending Less founder Ruth Soukup, EBA is designed to walk you through the key strategic steps of building a blog with clear instruction and plenty of exercises. Ruth’s focus is always to reduce overwhelm, make things simple and easy to understand, and break down the work into bite-sized chunks. I love that approach, because it keeps me focused on what’s important and helps reduce distractions. While EBA isn’t cheap, it’s incredibly valuable. There isn’t much blogging information that you can’t find online for free, but the beauty of EBA is how it lays it out for you in a clear order that has you building your blog (and business!) in the perfect sequence. No getting confused about what to do first, second, and third. You have a clear path from the get go. That, to me, is the greatest value of the course: the fantastic content, organized in a sensical flow that encourages you to stay focused on the right things and push forward. My only peeve with EBA is that it has some gaps, most notably, around gaining traffic and email subscribers. When you start Unit 8, which is all about product creation, she says you should only launch a product once you have 1,000 email subscribers. Well, many of us in the course did not have 1,000 email subscribers at that point, since our blogs were under a year old and building an email list only started a few units prior. This means we need to pause the course and boost our email subscriber count before moving forward. And that’s where I’ve looked to other courses and programs to help me increase my traffic and list size. Meaning spending more money to get to the point I need to be at in order to move forward. Other than that one issue, EBA has been fantastic and I’m looking forward to picking up the course where I left off. If you’re in EBA, you may be familiar with super-alumni Kim Anderson. Kim is the blogger behind Thrifty Little Mom, and has been so successful with blogging that she retired her engineer husband. Kim still blogs, but she also offers coaching services, courses, and mentoring through her site Kim Anderson Consulting. She also runs the Just Keep Blogging podcast which is a fantastic (and free!) resource that I’d recommend to any blogger. I’ve done coaching with Kim, and more recently I’ve joined the Just Keep Blogging Mentored Membership (JKBMM) Community. It’s full of helpful resources designed to fill in the gaps of your blogging education. So it’s perfect for those of us stuck around Unit 8 of EBA or just those looking for more guidance and on demand content. Every month, JKBMM has a different theme, whether it be Affiliate Marketing, Growing Your List, Product Creation, or something else. Kim creates a ton of content including articles, presentations, audio files, and videos, and gets into the details that most courses don’t cover. The membership also includes 2 live “Ask Me Anything”-type Q&A sessions with Kim, and access to a great Facebook group. The kicker for me, is that you get access to all the content she’s ever created in the site. It’s chock full of practical, hands on help that can make a huge difference in getting rid of barriers to your success. The JKBMM is only open for enrolment periodically, but if you join through my link, you can gain access anytime. I’ve actually used both a life coach and blog coach over the past few years, and it’s been really impactful. The real value for me lies in that it’s a one-on-one session where you get guidance and support about the areas that you’re currently stuck with. That focused attention can be incredibly effective, and it’s amazing how much learning you can receive in an hour-long session. I’d recommend seeking out a coach that specializes in the area you need the most help with. If you can, send them some questions or a recap of your current challenges before you meet, so that they can begin to prepare. Many coaches will actually request this information from you ahead of time so that you can use the session to its full potential. If you’re concerned about the cost of coaching, consider working with a therapist or psychologist. Many are covered on health insurance plans, and they can help you with the mental and emotional side of your business. Some also have other specialties – they may be a therapist and a life coach, for example. My post The Benefits of Coaching: My Top 5 Lessons offers insight into some of my key takeaways from working with a coach. This book was recommended to us in the Just Keep Blogging Mentored Membership Community and it’s fantastic. I read it initially for guidance with copy writing, but it presents a great framework for thinking about your business as a whole. The cost is really low, and it can have a big impact on your brand positioning and customer messaging. If you’re looking for guidance on making your brand messaging more customer-centric, I’d highly recommend giving it a read. Check out Building a StoryBrand on Amazon. This is another book that I highly recommend and talked about at length in How to Create a 12 Week Plan That Will Rock Your Goals. It presents an incredible framework for goal setting and managing your weekly tasks. Before planning in 12 week cycles, my work week was all over the place. I got a lot of things done, but they weren’t always the right things in the right order at the right time. I didn’t know how to measure success, and felt lost. Now I have a clear plan at all times, set realistic, achievable goals, and focus on the right things. If you’re a blogger and are interested in applying The 12 Week Year to your blogging work, I’d recommend Kim Anderson’s course The 12 Week Blog Growth Strategy. I took it, and it really helped me connect the dots between the book teachings and my blogging journey. I worked with Laura, the designer behind Pixel Me Designs, to design my logo, business cards, and a suite of coordinating social media graphics. She has a great ability to understand exactly what you’re looking for and translate it into something beautiful. Having a solid brand identity can be a great investment in your business. It makes things look professional and cohesive, and can communicate what you’re all about to potential customers. You can check out Pixel Me Designs here. Those are the six investments I made in my business that gave me the greatest return on my investment. I see them as the foundation that allows me to run my business day in, and day out. And they offer some insight into potential areas of investment for you if you’re looking to take things to the next level. If you’re a side hustler or entrepreneur, what have been the best investments you have made in your business? I’d love to know! Let me know in the Comments below.